Dubai: Hamriyah Free Zone, one of the largest free trade areas in the Middle East, has attracted 5,200 companies that have collectively pumped in Dh73 billion since its inception, a top official said. The UAE's second biggest free zone after Jebel Ali Free Zone, Hamriyah Free Zone, has attracted more than 1,500 since October 2008 — when the global financial crisis hit the UAE — that necessitated a Dh600 million expansion to expand its land area. In an exclusive interview with Gulf News, Dr Rashid Al Leem, Director-General of Hamriyah Free Zone Authority, explains the reasons behind its success. Gulf News: Could you comment on the investment flow over the last few years in the UAE and the Gulf in general? Dr Rashid Al Leem: There is a positive trend but with certain fluctuations. Two years ago we had seen a significant drop in the inflow of foreign investments comparing to earlier years, which was a result of the world financial turmoil that affected every corner of the globe. But, despite the temporary economic slowdown, UAE remains one of the most attractive investment destinations in the world. It's currently ranked 33rd in the World Bank's "Ease of Doing Business" report and holds 11th position in The 2010 A.T. Kearney FDI Confidence Index. It's been a long-term strategy of the UAE government to diversify its economy away from oil and gas sector and create favourable environment for international investors. The free zones of the UAE significantly contribute to the development of national economy. Number of new companies that are being established in the free zones increases annually at a very rapid pace. Could you also shed some lights on how the free zones contribute to the local economies? The free zone concept works perfectly with specifics of the region. Perhaps it had never been more successful than in the UAE. Besides serving its main purpose of attracting foreign capital to the economy, UAE free zones do not compete but rather compliment each other which makes it even more beneficial to the country's economy. According to the recent figures from the Federal Customs Authority, the total trade volume of free zones in the UAE grew by 23 per cent in 2010 from Dh286.6 billion in 2009 to Dh352.8 billion. 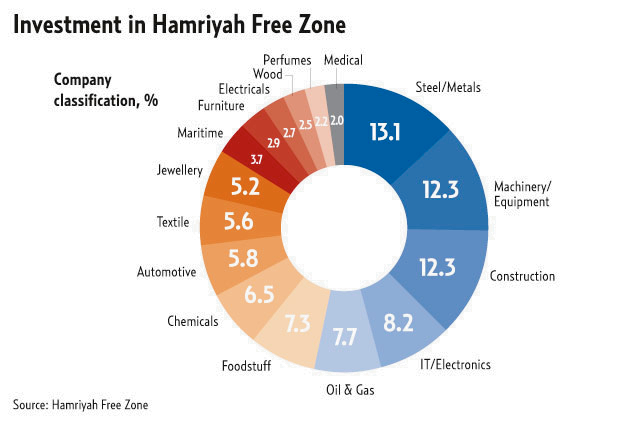 How is Hamriyah Free Zone's contribution to Sharjah's economy? Hamriyah Free Zone plays an important role is accelerating business activities within Sharjah by attracting environmentally friendly industries and enhancing the overall economic development of the country. Hamriyah Free Zone offers best infrastructure facilities and high quality services to welcome foreign investment in various sectors like manufacturing, trade and services. In the last five years, the gross domestic product (GDP) of Sharjah has increased by about 11 per cent annually. Hamriyah Free Zone is also complementing federal and local economies by bringing value-added business into the region. How do you position Hamriyah Free Zone among all the free zones in the UAE, in terms of your location and the incentives offered? Hamriyah Free Zone is a free zone with a special focus on SME sector. Apart from tax-free environment, full ownership of business and state-of-the-art facilities and infrastructure we offer unique business solutions for SMEs that include discounted lease rents, simplified procedures and minimum formalities. To support this important sector we also negotiated agreements with several local and international banks to provide corporate and individual credit facilities to assist SMEs in fast-tracking their business set-up. What is your USP (Unique Selling Proposition)? Why should an investor choose Hamriyah Free Zone, over others? Our main objective is to empower investors in their ventures and assure that they have everything necessary for smooth operation of their businesses. Hamriyah Free Zone is built around a work-friendly environment and minimum regulations, transparency and red carpet treatment. Hamriyah Free Zone investors engaged in import and export of commodities also benefit from easy access to three seaports and a "Sharjah link" which is a unique trade corridor that gives businesses an unmatched logistical advantage, straddling the Arabian Gulf and the Indian Ocean. The Hamriyah Port is attached to the free zone, other two major seaports Khalid Port and Khorfakkan Port are within a short distance. Sharjah International Airport, the regional hub for many air cargo operators, is less than 15 minutes away from the free zone. How many companies did Hamriyah Free Zone attract during the post-meltdown period (from October 2008)? Even when recession was at its peak during the 2008-2010 period, we saw number of companies grow exponentially — from 3,341 in 2008 to 5,000 in 2010 — a growth of almost 69 per cent. In the first quarter of this year, we have already registered 450 companies with an average of 150 every month, which makes it obvious we have the right strategy, the right culture and the right product to deliver consistent and sustained value for our investors. How many registered companies are currently operating in Hamriyah Free Zone? To date there are more than 5,200 active companies representing 137 countries operating from Hamriyah Free Zone and the number is growing. You are expanding the area. How many square kilometres are being added to the existing site? About 11 square kilometers are being added for development due to high investor demand. 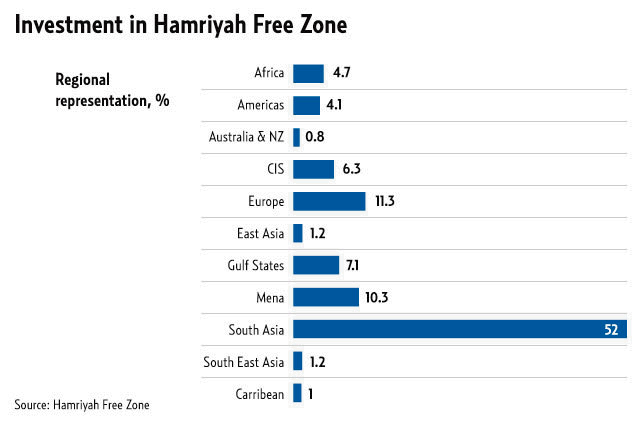 How much is Hamriyah Free Zone's investment in expansion — recent investments? Would you be able to tell us how much investment Hamriyah Free Zone has attracted since its establishment, in US dollar figure? According to our recent estimations this figure stands at over $20 billion. Hamriyah Free Zone has categorised companies into maritime, industrial, commercial and other sectors. Could you elaborate more on these? Hamriyah SME Zone is a one-of-the-kind concept bringing together diverse industries in an efficient manner. The seven sub zones that form the Hamriyah SME Zone comprise Oil & Gas Zone; Petrochemical Zone; Steel City; Construction World; Timber Land; Maritime City and Perfume Land. An area of approximately 10 million square metres in Hamriyah Free Zone Phase II is levelled at Free Zone expense with base line data studies and the whole area is made ready to use with efficiency and agility. These magnificent zones are complemented by MB Zone and E-Office packages to ensure smooth start up for small operations. Going forward, what are your plans to attract more investments? We are researching to penetrate new markets where we feel the potential is growing, such as Asian and African markets. We are continuously working on promoting the free zone, our well-informed teams travel to international events, conferences and expositions worldwide. We are also very active in roadshows, meeting international businessmen worldwide. Who are the largest investors, sector wise? Trading is the largest sector. Who are the largest investors — nationality wise? Indians are the largest investor group. Could you kindly elaborate your new initiatives? Our latest project Hamriyah Logistic Village is aimed on providing all-in-one logistics and distribution centre for companies operating in the Free Zone. This initiative is a part of the Government of Sharjah vision for Emirate's industrial and commercial sustainable growth. Our latest projects are Hamriyah Logistic Village and Hamriyah industrial Zone. The Logistics Village is aimed on providing all-in-one logistics and distribution centre for companies operating in the free zone. This initiative is a part of the Government of Sharjah's vision for the emirate's industrial and commercial sustainable growth. The area will include 220 warehouses in range of size from 200 square metres up to 800 square metres. Hamriyah Industrial Zone is a especially dedicated area with 144 land plots of 5,000 square metres each. This zone is another addition to the Hamriyah SME [Small and Medium Entgerprises] Zone." How do you finance expansion — bank loans or self-funds? Is there any plans to borrow funds for further expansion? Are you in touch with banks on possible debt/bond/sukuks? Would you shed some lights on your sustainability and corporate social responsibility initiatives? Hamriyah Free Zone's Vision is ‘To Become A Sustainable Free Zone" and as a part of adding value to our commitment on sustainable development, Hamriyah Free Zone Authority (HFZA) announced the release of "HFZA Sustainability Policy Statement" during June-2010. Corporate Social Responsibility (CSR) has always been one of a key focus to achieve Sustainable Development, for which two CSR platforms christened as Hamriyah Green Team & Hamriyah She-Q Club were kick started by HFZ. Hamriyah Green Team objective is to create awareness and develop green consciousness and practices of green-clean environment within HFZ; propagate, roll-out and implement various corporate social responsible initiatives of the Hamriyah Free Zone. Hamriyah She-Q Club is a HFZA-HFZ Investors friendly, non formal, non-governmental forum/club comprising of nominated QHSE representatives from the Hamriyah Free Zone's investors to educate, share and update latest technologies, best practices and best Fit. Hamriyah Green Team and Hamriyah She-Q Club has made major inroads within a year in reaching out to both the QHSE professionals and also to the grass root community in HFZ, eventually transforming itself into a change agent for achieving QHSE and social excellence and thereby adding a great value to both Hamriyah Free Zone and the emirate of Sharjah on a whole. Dr Rashid Al Leem holds an MBA from Atlantic University in the US. He has multiple honorary doctorates from Somalia University for Humanitarian Services and American Global International University in the US to his credit for his global business contributions and numerous academic accreditations. He is widely considered a thought leader in business, socio-economic, academic and cultural fields. As the Director-General of Sharjah Ports and Customs and the Hamriyah Free Zone Authority, he is the driving force in transforming them into a strategic commerce hub and empowering thousands of businesses in the region, contributing to the development of the UAE economy. He is the board member of World Association of Small and Medium Enterprises, Sharjah Charity International, Sharjah Medical Zone, American Business Council of Dubai and the Northern Emirates, German Emarati Joint Council for Industry and Commerce and World Trade Development Council in Hong Kong, besides being an honorary lecturer in numerous local and international universities, including the American University of Sharjah. Rashid Al Leem has authored many books and articles in journals and magazines in both Arabic and English. Hamriyah Free Zone Authority was established by an Emiri decree issued in November 12, 1995. It is located in Sharjah, UAE, which gives the Free Zone a unique geographic and time zone advantage backed by a secure and fully convertible currency and a multi-access to neighbouring and global countries through land, sea and air. Currently, hosting more than 5000 companies from 137 countries, HFZ is fast becoming one of the cornerstones of the United Arab Emirates industrial development. Hamriyah SME Zone offers seven strategic clusters comprising of the Oil & Gas Zone; Petrochemical Zone; Steel City; Construction World; Timber Land; Maritime City and Perfume Land. These magnificent zones are complimented by E-Office packages to ensure smooth start up for small operations. HFZ has implemented an Integrated Management System (ISO9001:2008, ISO14001:2004, OHSAS18001:2007 International Standards by TUV NORD, Germany) to effectively meet its commitment on Safety, Health, Environment and Quality (SHE-Q).